Today I am checking out of this hotel and moving back to the hostel? Why, just one more night and off to Brussels. The hostel is cheaper, and they have a computer where I can print out my boarding pass for tomorrow (on European discount carriers, like Ryanair, you save money by printing them out beforehand). What I have found here in Seville is that at cheap places like where I like to stay in the old-town(which is comprised of small alleys in addition to thin streets), besides the rooms being quaint (my room in the hotel is small, and doesn't even have a tv), the windows are often open to let in air, and noice from the alleys below echos into the room. For example, in the hostel, early in the morning while still in bed, someone in the ally below was whistling the last part of "Hey Jude" over and over again. And I just knew that the seven others in the room we're hearing it as well. Here in the hotel, my room has a window where I can hear what happens in the lobby, and I thought I heard the song "Rockin around the Christmas Tree". I did a double-take on that one, as that doesn't seem to be par-for-the-course for Spain in June. 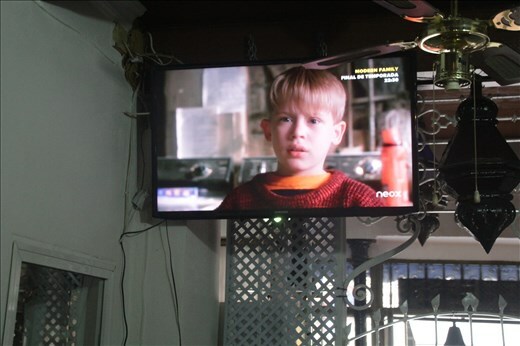 But a few minutes later I walked down to leave the room, and sure enough, Home Alone was playing on the lone tv in the lobby. Entertaining, but I am not sure it is as entertaining as hearing Drunk Spanish.